chevycrew wrote: Selling the lowers seperate allows someone with bent lowers to upgrade when replacing, then when time and money allows they can do the uppers. Very true, as long as there's an understanding that they need to keep them the stock length, or close to. Oh... Well If James is getting them, then I am too!! I let James do the fancy number crunching and I'll just nod along and pretend like I know what the feck he's talking about. "Yea yea, 1.21 Gigawatts, I agree, James." You could sell these to the OS members... tell them they come in chrome and have stickers too! True. Or the TBSS/street guys who just want to firm things up to remove wheel hop/etc and arent going to fool with the length. I agree though, watching the pinion angle is a must. Thanks for the mathmatics assist James!!! DirtyBacon04 wrote: Oh... Well If James is getting them, then I am too!! I let James do the fancy number crunching and I'll just nod along and pretend like I know what the feck he's talking about. Really, really, happy to see this product designed and built. 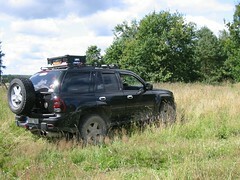 As for the strength aspect, from an overlanding perspective, i.e. the places I've travelled to (so far) and the various challenges presented there, I would think they are more than sufficient. The other benefits (adjustability, losing the rubber bushings, etc.) just add to the worthiness of the upgrade. One question ... if, lets say, a single bar were to meet with a catastrophic incident , would you sell just a replacement bar (no ends or bushings)? Upgrading these parts where in my mind. I have looked so far for the adjustable Spohn parts and would like to center the rear axle with the panhard bar and 1 Inch back with the control arms. Parts from Spohn cost me $590, your parts look way more better and your price is better! Spohn could deliver to germany, how about you? So your website tells shipping only to u.s., or would you ship to germany? looks like a nice product, any chance you'd be interested in giving as a .250 wall lower option? This is how you rotate our rear axle to correct the angle after suspension lift. My axle did not rotate with my adjustable panhard bar. It just centers axle side to side. Control arms could rotate the axle but I have not needed to. AlekG wrote: Really, really, happy to see this product designed and built. Yes, we can build a .25 wall version. Increasing tube diameter would not be easy, though, clearance issues. Yes, we would have no problem selling any part of it for replacement purposes. Karo wrote: Upgrading these parts where in my mind. I have looked so far for the adjustable Spohn parts and would like to center the rear axle with the panhard bar and 1 Inch back with the control arms. Parts from Spohn cost me $590, your parts look way more better and your price is better! Absolutely we can ship to Germany, or anywhere else. HARDTRAILZ wrote: My axle did not rotate with my adjustable panhard bar. It just centers axle side to side. Control arms could rotate the axle but I have not needed to. I was not clear on that sorry, I was talking about the control arms not the panhard bar. Do you have a rough idea of the price? I could weld something up in the garage, but I've been pretty unmotivated lately. Plus I like supporting US companies. AND to kick these off were going to offer 10% OFF on any of these new items for the next 30 days, and as always $5 shipping to the lower 48 states. Use code TOUGHTB when checking out. Infamouz has a set (of uppers and lowers) coming his way!!! Last edited by K STYLEZ on Tue Feb 07, 2012 2:39 pm, edited 1 time in total. I'll be ordering mine "soon". Haha, soon is a fun word. I just need to decide if I'm going full monty or not.